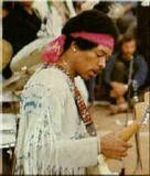 Jimmy Hendrix 70, Live at Woodstock! Jimmy Hendrix, the Guitar Legend who changed the the face of Music would have been 70 on 27 November! He was born in Seattle on 27 November 1942, and bid an untimely farewell on 18 September 1970, at the age of 27 years! I was lucky to witness the scintillating, charismatic Jimmy Hendrix today on the big screen! In Celebration of the 70th Anniversary of Jimi Hendrix's Birth and for the very first time, Hendrix's unforgettable 'August 1969 Woodstock Concert' (Bethel in NY) is released on the big screen and in surround sound. It was magical to watch him play with the sound, with just barely touching the guitar strings at times -- his teeth, tongue and his back also produced mind-blowing sound with the guitar strings, the way only he can! The performance is an all time classic and I would say, 'The best in rock music history'! The amazing experience included 'Voodoo Child (Slight Return)','Fire', 'Purple Haze', 'Foxey Lady' and 'Hey Joe', as well as the most dramatic interpretation of the 'Star Spangled Banner' and the listeners were in another world!! It also had interview with the band, Mitch Mitchell and Billy Cox and the Woodstock Promoter Michael Lang. An experience not to be missed and it was amazing to watch a sea of people enjoying the magical play of the inimitable sound from Hendrix's guitar strings! 'The Jimmy Hendrix Experience', not to be missed!